Pure Cycles approached us over six years ago to partner with them in redesigning their existing Shopify website. Since then we've help create multiple versions, migrate to Shopify Plus, and elevate the brand to being one of the most well-known Shopify brands today. 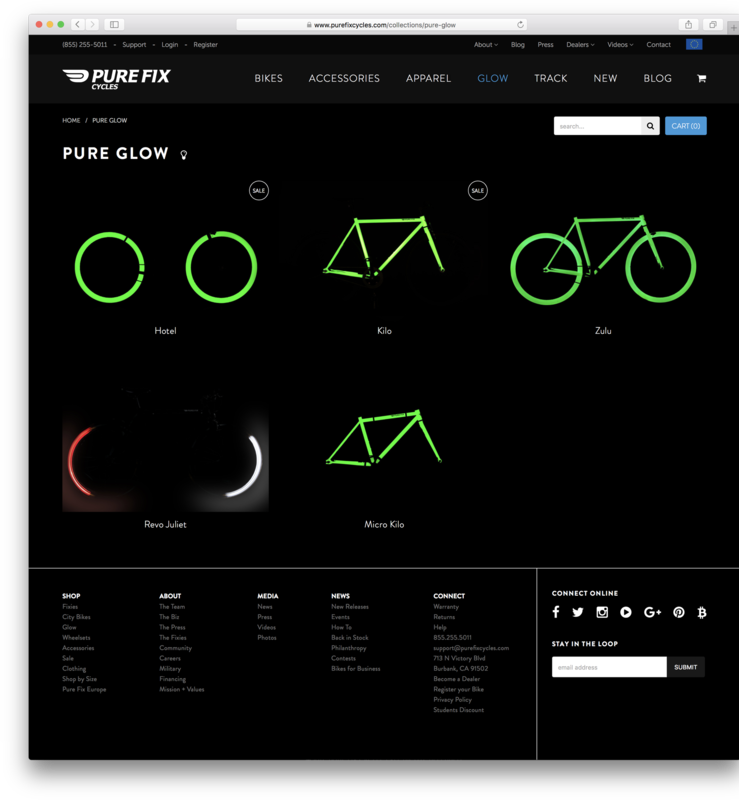 Pure Fix Cycles target customers are active people who are on the go. With this in mind, designing a website that functions beautifully on mobile devices was one of our top priorities. The responsive Shopify theme adapts to any device to ensure a consistent experience for Pure Fix Cycles customers. Creating an experience that distinguishes a brand is no easy task. 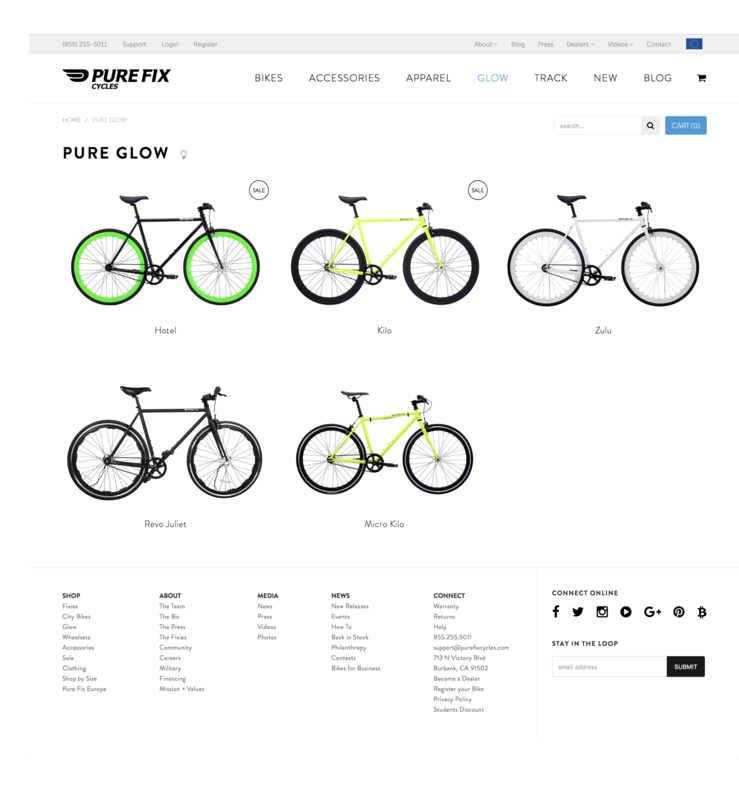 We spent time getting to know Pure Fix Cycles and their processes first. From inquiring about their products to discussing issues with the existing website, our goal was to know their business as well as possible. At Rehash, we truly believe our success is tied to our client's. We put the same effort into our client's success as we do our very own. Our final product turned out great. Details matter to Pure Fix Cycles, and the final design showcases this throughout. Visting the Glow Series page will demonstrate how we use subtle features to bring the entire experience together. "We hired Rehash to take our web presence to the next level. We were looking for something perfectly tailored to our needs and that is exactly what we got. Working with Rehash was just like adding another person to our team - communication was seamless and easy. With the little direction we provided, they built a brand new store for us that utilized all the newest web technologies. Working with Rehash was a ton of fun and we're delightfully satisfied with how the projects have turned out."